Exploring a new city can be tiring for a family, and sometimes you just need a good meal, fast. To help you out, here is a list of tasty and easy meal options available around Amsterdam. Founded in Amsterdam in 1996, Bagels and Beans brought the popular American bagel to the Netherlands…but with a twist. Here the bagels come in flavours inspired by Europe – with flavours such as goats cheese with honey, mature Dutch cheese, ‘Tuscany’ and Carpaccio available on the menu. 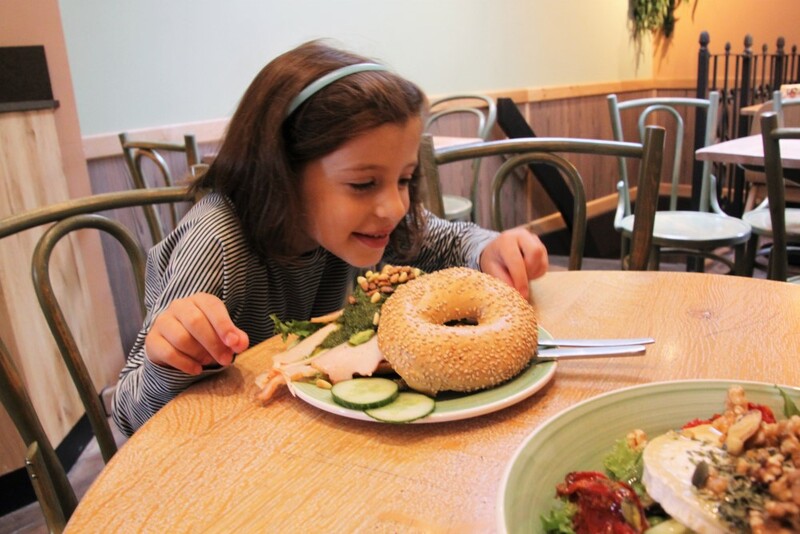 The food is always made fresh to order, and you can choose from a selection of bagel types and cream cheese options to craft your ideal meal. Bagels & Beans has several locations around town, and are a great spot to visit for brunch or lunch. You can also order to takeaway, and if you are with kids they will even offer them a complimentary mini smoothie while you wait. Started up in Amsterdam by three school friends, Burgermeester is a trendy and tasty burger joint that is worth visiting. All of the products used here are from quality, sustainable sources (this includes the meat, bread, salad, coffee, electricity and even clothing!). 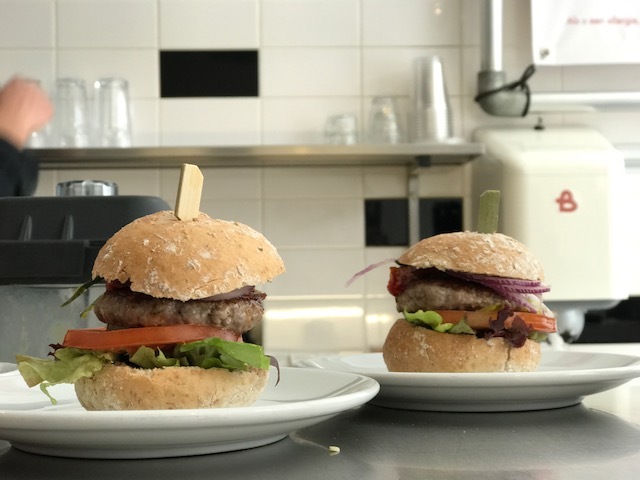 Burgermeester have a strong philosophy on their produce: the meat comes from a local farm in the Netherlands that breed their cattle in an environmentally and animal friendly manner, but if meat is not for you they also have vegetarian options available. Burgermeester also make all of their own sauces from scratch using fresh, local ingredients (free from additives and flavour enhancers). While you can’t get fries with your burgers – Burgermeester offer a small range of other sides (including corn on the cob and salad) as well as milkshakes and nice beverages. You can find them at several locations around town, including one just opposite Artis Zoo. Le Pain Quotidien is a bakery chain which originated in Belgium and has (thankfully) found its way to Amsterdam also. Here you can enjoy a selection of delicious breads and spreads, eat in or takeaway. There is also plenty of other delicious food choices for breakfast, lunch, or afternoon appetizers. It is a lovely place to come with the kids for a slow start on a weekend or just as easy to take away some delicious breads and enjoy in a nearby park! Established in 2013 by a local family here in Amsterdam, SLA is a healthy salad bar that offers a range of fresh salads, tasty soups, smoothies and dips. You can compile your own salad — where you get to choose your own toppings, sauces and salad base – or simply select a ready-made option. There is plenty to choose from and the main philosophy here is to provide healthy and nourishing food, so you can really feel good about your meal choices while on the go. A great Asian restaurant for quick and tasty meals, Wagamama has four locations around Amsterdam and also provide takeaway and home delivery. Their food is always made fresh to order and there is a broad range of meal options to choose from. Wagamama even offer a kids menu, which makes eating out with the famiy here really simple and easy. For those evenings when you really don’t want to (or can’t) leave the home, and don’t want to have to cook – you can bring a restaurant home to you by using one of the popular home delivery services available. Deliveroo and Foodora both offer a great service whereby you can select your dinner from a participating restaurant in town, and they will pick up the freshly made meals from the restaurant and deliver it straight to your door by bike (so very Dutch!). It’s really so easy to do – you simply select the restaurant of your choosing and order and pay online, then before you know it they will be at your door and you have a ready made restaurant meal at home. There are lots of restaurants, salad bars and cafes to choose from, so you can peruse the selections and see what whets your appetite. You can even order wine and beer, just like if you were eating in the restaurant itself. Perfect for a lazy night in!